Several English treatises from the late medieval period describe the singing of discant, the provision of an improvised line moving note-against-note with a piece of chant. 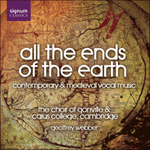 Leonel Power’s treatise dating from the first half of the fifteenth century gives full details of this kind of practice, giving many examples of how the free line might move in relation to the chant. Movement in thirds and sixths was encouraged, whilst parallel fifths and octaves were prohibited. Although improvised discant was normally performed in two parts, John of Tewkesbury’s treatise refers to a manner of performance with chant, discant, and up to three other voices moving in parallel with the chant using the fifth, octave and twelfth. 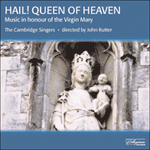 This work contains a conjectural realization of this type of sound (with no claim to authenticity) based on the Sarum version of the Marian antiphon Alma redemptoris mater, combining the full five-part texture of Tewkesbury with a discant line moving in accordance with Power’s suggestions. John of Tewkesbury observes that although the sound is of many people singing at once the music is in fact very simple, with only one person singing an independent line. Although the discant line is consonant throughout with the chant itself, the use of the fifth and twelfth inevitably provide a considerable level of dissonance. Maria nos Deo filio tuo reconcilia. predicaverunt et regine laudaverunt eam. that great Mary—reconcile us with God thy Son.